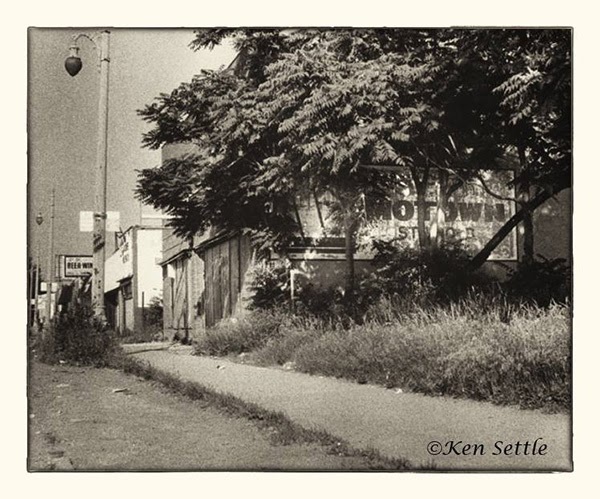 From the film archives: Many, many years ago, I wanted to go photograph what remained of the old Motown Studio B. Though everyone knows about Motown's "Hitsville" Studio A, relatively few people were familiar with Studio B on Davison near Livernois in Detroit. This was the location of Golden World Records, who had a hit with The Reflections "Just Like Romeo and Juliet." In the mid '60s, Berry Gordy purchased Golden World and turned it into Studio B. This was the place where many of the incredible Motown vocals, horns and strings were overdubbed. Most pivotal to me, was that Marvin Gaye's vocals for the groundbreaking What's Going On masterpiece were done right here at Studio B. Studio B sat vacant for much of the time after Motown moved to L.A. and has finally been torn down. At the time that I photographed this, you could still see a very weather worn Motown Studio B sign on the side of the battered structure. I used the old Kodak Recording Film 2475 for this photo, because I wanted the incredibly grainy results that this film gave, along with its extended red sensitivity. I became real interested in that film for a time after I learned that many of the photos of the '67 Detroit riots were shot on this film. It was one of the first high speed (ISO 1000) films ever. Every time I look at this photo, I hear Marvin Gaye singing "Mother, Mother, there's too many of you crying."